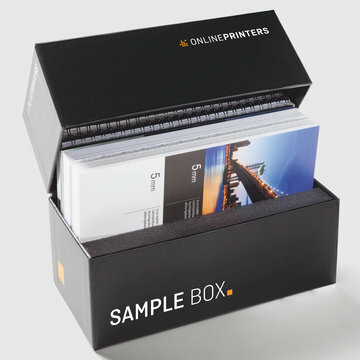 Our new, high-quality SAMPLE BOX contains our current paper sample book with the various paper types and finishes, our new material sample book with original samples from our large-format printing product range (banners, flags, photo print) and material samples of other advertising systems such as Plexiglas® signs, corrugated plastic boards and many more. Furthermore, it includes a print catalogue with the descriptions of our product categories. The SAMPLE BOX gives you an overview of our wide product range, facilitating the selection of materials and finishes through visual and haptic samples. So you can see for yourself how text and images will appear on the respective surfaces, allowing you to choose the material that is perfect for you. Please note that we cannot guarantee that all materials are included in this SAMPLE BOX due to the constant broadening of our product range. You will find the current content of the SAMPLE BOX in the tab "Details" as a PDF for download.